Why not turn the trip to Coachella into a first-rate road trip? OK, done. 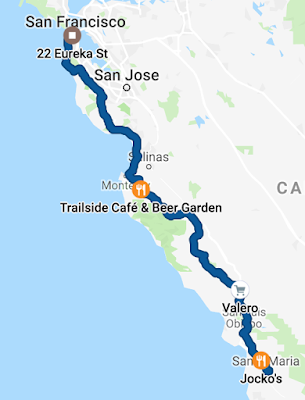 1230 miles later, I can attest that California's backroads are spectacularly beautiful in springtime. Words fail me in describing these breathtaking landscapes. Fortunately, however, I can find the words to describe the best roads I found. 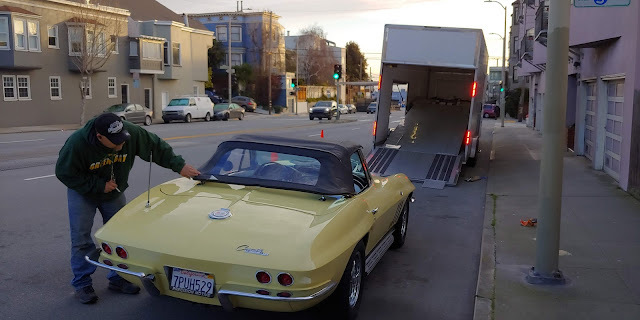 Time to sum up my 3 years with a 1965 Corvette convertible. Well, for starters, it was very different from the modern-era Porsche 911 Turbo that it replaced. From a pure performance point of view, it was no contest -- the Porsche is a modern almost-supercar, while the Corvette is an antique. But driving is not all about performance. In fact, maybe it's not even mostly about performance. Because driving the Corvette was always an occasion. 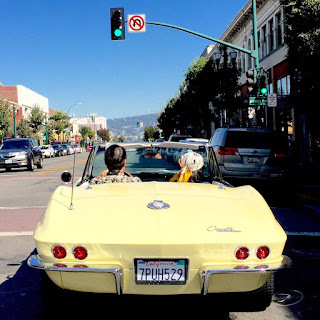 Take it out, fire up that (very loud) V8, inhale that 60s American engines-gasoline-and-oil scent -- well, it was never just driving. It was an event. Neither the Porsche nor the new Miata have that. Hell, no car I've ever driven before had the sense of occasion and curb presence delivered by this one. 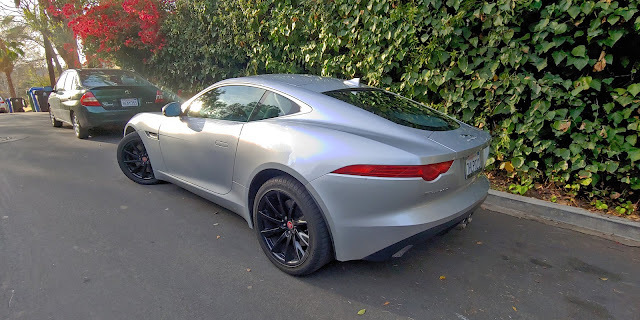 Thanks to Turo, I was able to rent this 2015 Jaguar F-Type Coupe on a short midweek trip to Los Angeles (only $75/day!). It's the 340hp, 6-cylinder supercharged base model, with the 8-speed ZF automatic transmission. Coming in around $62k new, this one has already seen nearly 58k miles and some minor wear, given its "bought for renting out on Turo" life (the owner has a half dozen cars on Turo). Turning up the subwoofer revealed some annoying interior rattles, so I preferred the engine noise to the stereo for entertainment. Well, the time has come to sell the Corvette, which I've already kept for two years beyond my "one year" rule. So it's time to take care of the final little maintenance items. First up, the steering coupler. It was worn when I got the car, and my trusty Corvette specialist, Pat Hendrix, has been mentioning it to me. It was never a safety risk, but better to tidy it up with a replacement. Second, while we're in there, I wanted to raise the electric radiator fan trigger temperature from 180 to 195. The car has no trouble with overheating in regular driving, so no need to run the radiator fan at normal coolant temperature. After the adjustment, the electric fan only kicks in when I'm trapped in traffic after heating the engine up on the highway for a spell. Which is exactly when having the electric fan is handy! Third, Pat mentioned that there was an oil leak from the oil pan gasket, so I decided to fix that, too. This is a long-term purchase, so it brings my "different, interesting, fully-depreciated cars every year" experiment to a premature close. I always knew I would end up in a Miata, I just didn't realize it would be quite so soon. I love the Miata. I drove my first Miata in 1991 at a dealer in Chesapeake Bay. It was love at first drive. But it wasn't until 8 years later that I could afford one -- a lightly used 1997 in Montego blue. I kept that car for 11 years. I still miss it. So it was inevitable that I'd be in a Miata again someday. And when Mazda announced the new, fourth generation of the Miata (the "ND" version to enthusiasts) for the 2016 model year, I nearly ordered the "launch edition" off the boat. Since then, nearly every car critic who has written about the ND Miata has rhapsodized about it. In fact, by car reviewer consensus, the ND Miata probably ranks as best all-around, affordable sports car on the market today.